The Window > Preferences... > Plug-in Development > Target Platform preference page allows you to manage a set of target definitions and select one as the active target platform. A target definition consists of a set of plug-ins and environment settings. The active target platform is used to build and launch your workspace plug-ins. The preference page will list all known target definitions. 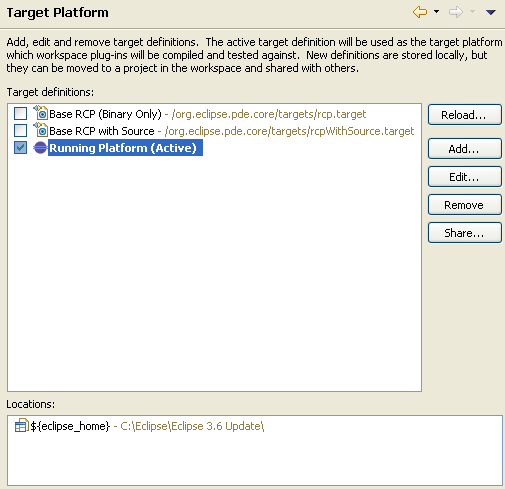 Some target definitions will be saved with Eclipse preferences, but this page will also display target definitions found in the workspace and external definition files that have been opened in the workspace. Definitions in the workspace will have their workspace location displayed in brown next to the name. The target definition that is currently being used as the active target platform will be checked, marked "Active" and be bolded. Change the active target platform by checking a different target definition. Any changes made on this page, including editing of target definitions, will not be saved until OK or Apply is pressed. The default target platform points to the Eclipse application you are currently running. It is marked with a special Eclipse icon. You can restore the default target platform at any time by pressing the Restore Defaults button. Reload can only be pressed if the active target platform is currently selected and hasn't been changed while the preference page is open. Pressing it will force the target definition to resolve, refreshing the contents of any directory locations and downloading any out of date plug-ins in site locations. It is helpful to reload if you have changed something in your target platform outside of Eclipse. Any problems with the target will be displayed in a dialog. Press Add to create a new target definition. The New Target Wizard will provide multiple options to create a new target. Press Edit to edit the selected target definition. This will open the Edit Target Wizard allowing you to edit all settings in the definition. You can also double click a target definition to edit it. Pressing Remove will delete the selected target definitions when OK or Apply is pressed. If you remove a target definition that is stored in your workspace, it will be deleted. Move allows you to move a target definition stored in the Eclipse preferences to the workspace. The Move Target Wizard will have you choose a location in your workspace and a file name ending in ".target". The new location will be displayed in grey beside the target name and will be applied when OK or Apply is pressed. At the bottom of the page there is a Locations group. This table will display information about the currently selected target definition. It provides a quick way to see the contents of a target.